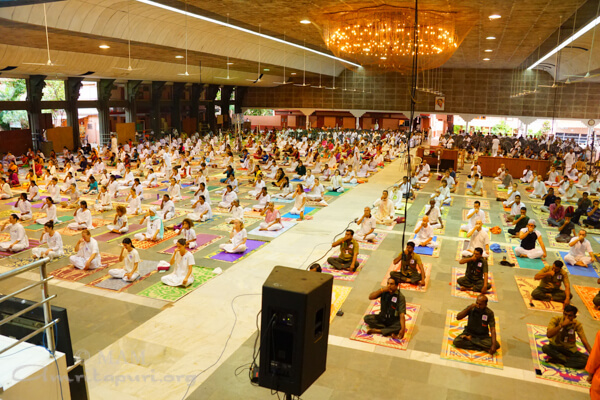 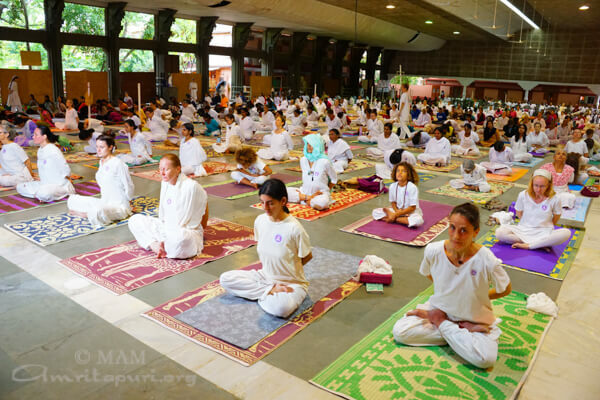 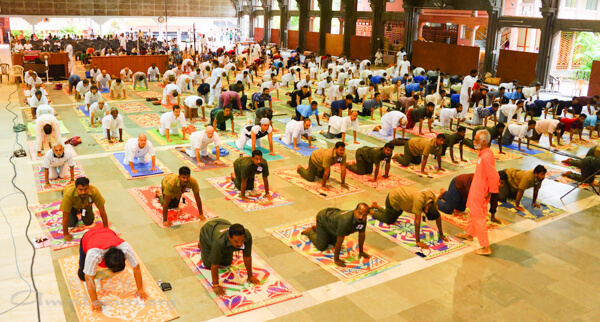 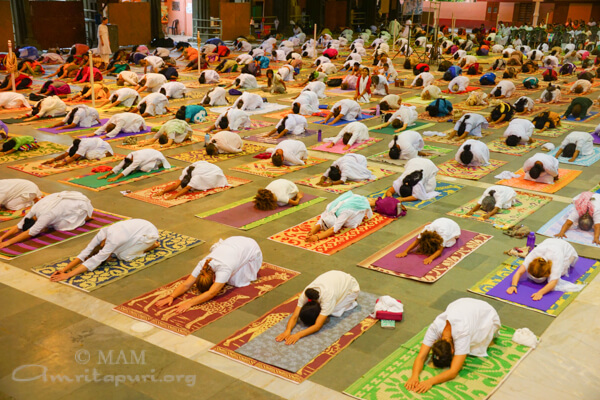 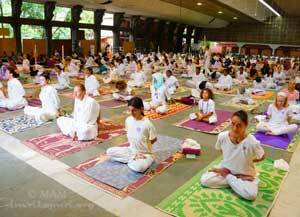 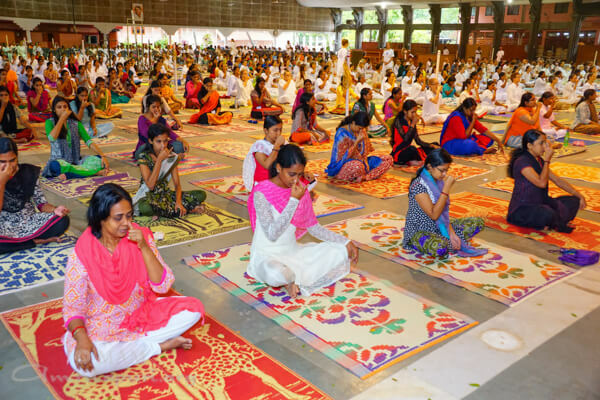 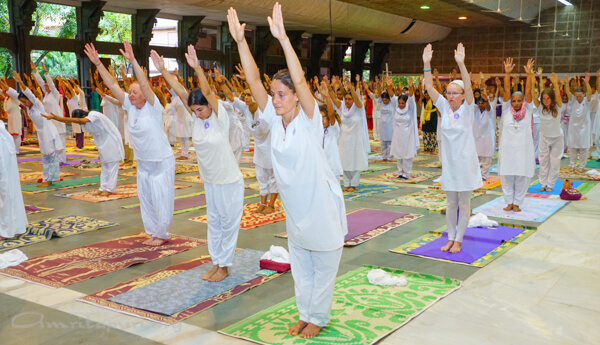 The main hall in the Ashram was full this morning as a Yoga classes were conducted to celebrate the day. 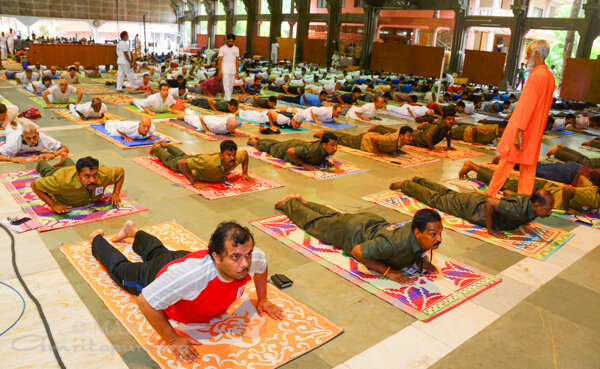 More than 1000 participated in this yoga celebration, including children, youth and old aged. 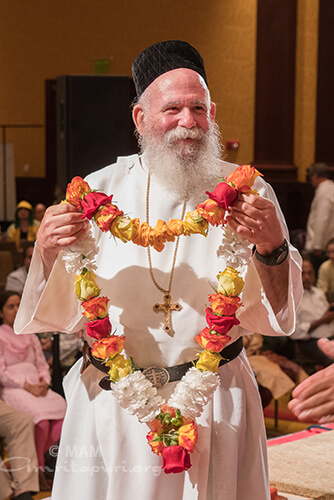 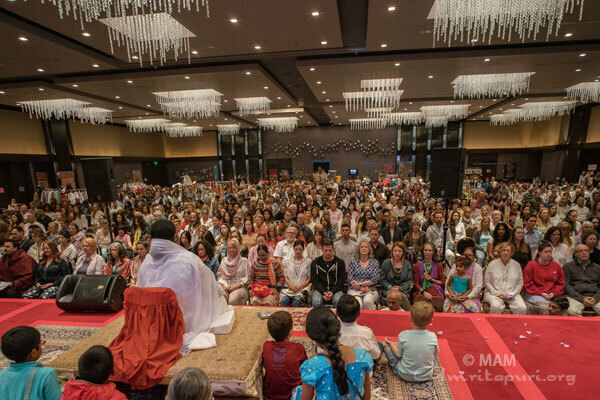 Amma returned to the Hilton Los Angeles Airport hotel for three days of programs on June 14th-16th. 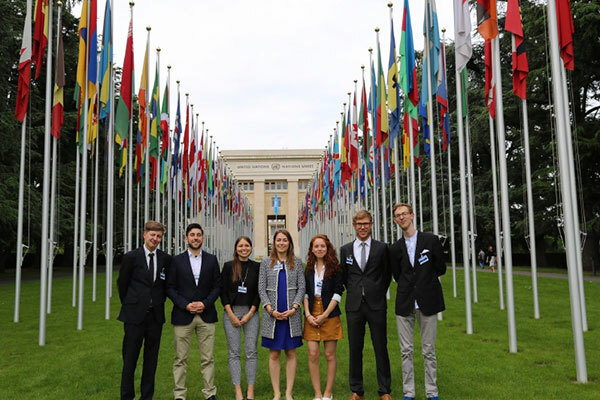 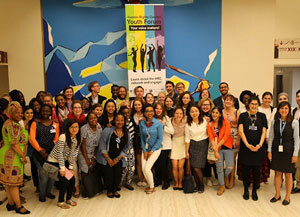 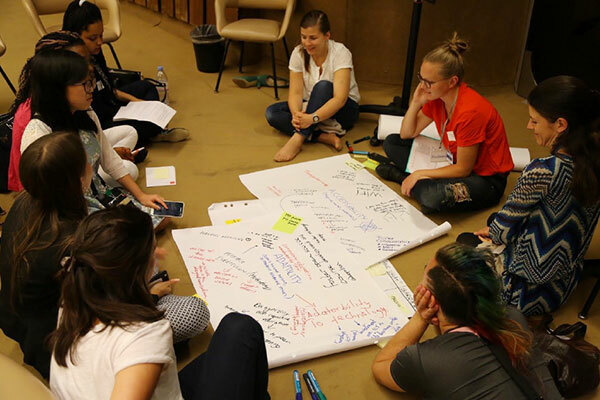 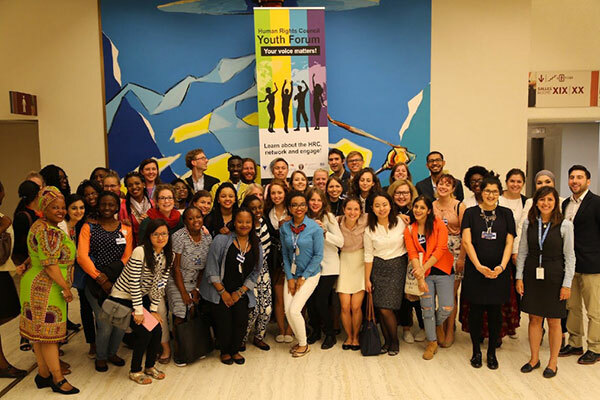 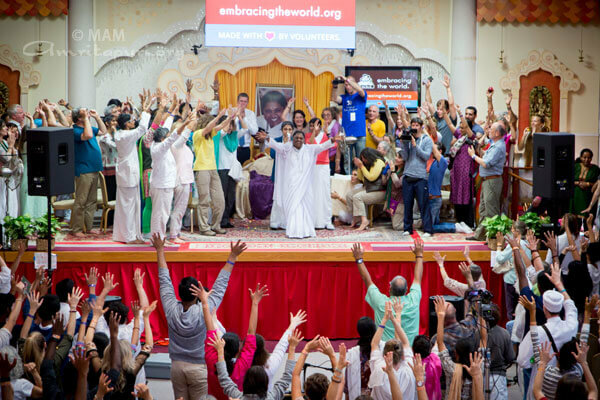 During the first evening program, a representative of MA Center-LA announced that the Center has recently launched two Embracing the World programs in partnership with three local non-profit organizations. 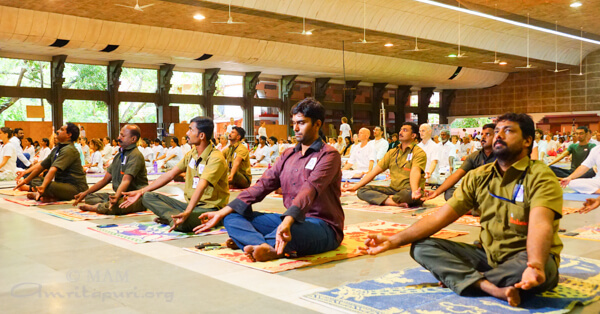 Through partnerships with New Directions for Veterans and with IDEPSA Community Job Center for Day Laborers , IAM classes (Integrated Amrita Meditation) will be taught to disabled war veterans and those suffering from PTSD, as well as to day laborers to help reduce stress in their daily lives as they struggle to support their families. 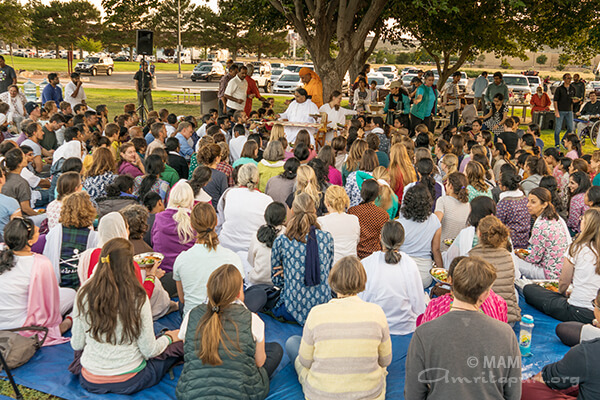 In an additional partnership with City Plants, MA Center – LA has committed to planting 5,000 trees in low tree canopy cover neighborhoods in Los Angeles. 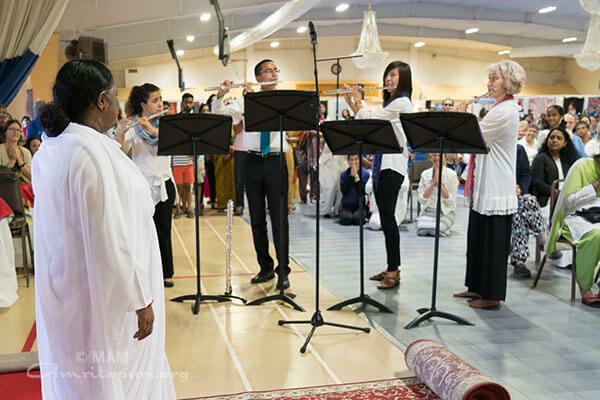 Representatives from the three non-profit organizations – Veterans Services, IDEPSCA and City Plants – were on hand to garland Amma. 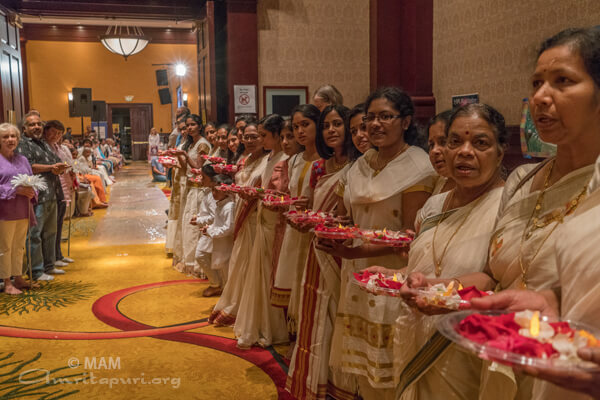 During the programs, local satsangs sang bhajans and local devotees danced traditional Indian dances. 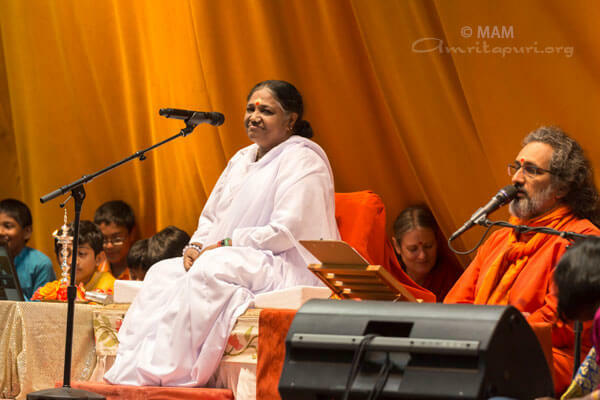 At the end of the second evening program, Amma delighted everyone by singing two new bhajans. 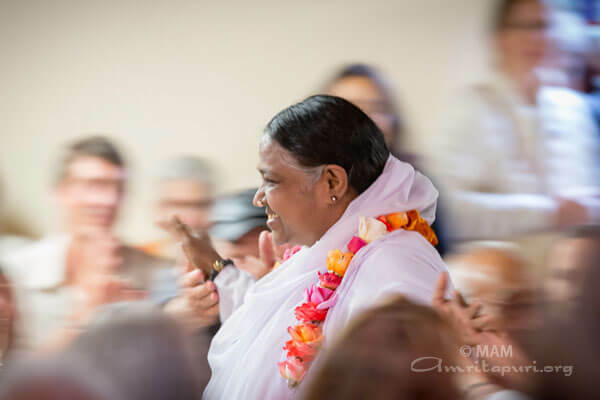 Amma will be giving talk, bhajans, meditation and Darshan to all during these sessions. 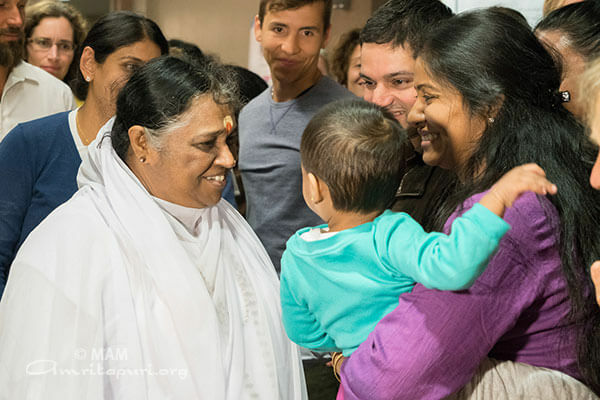 After Seattle, Amma headed to the San Ramon Ashram where she has been holding programs for the past 27 years. 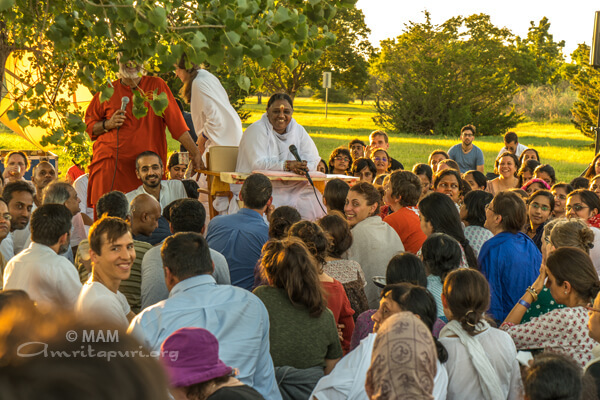 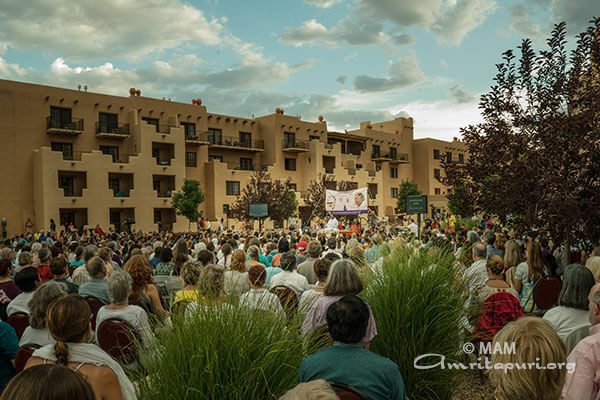 Amma held three days of public programs followed by a retreat, concluding with Devi Bhava on June 12th. 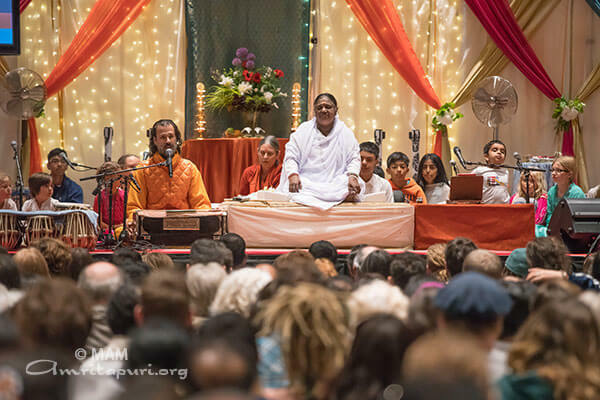 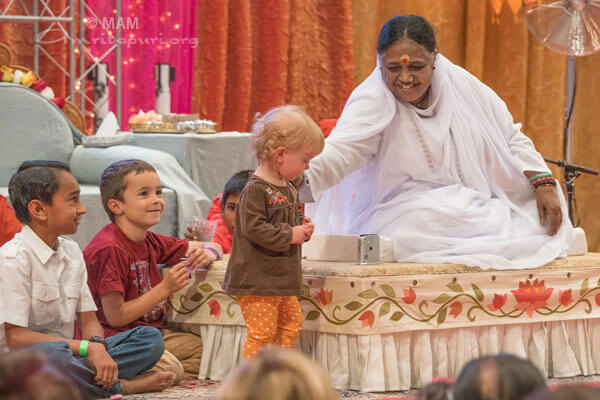 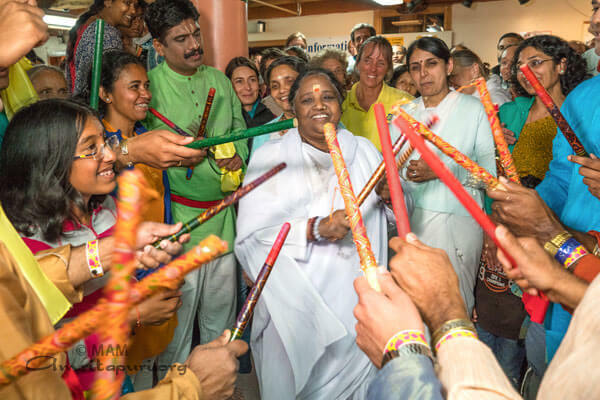 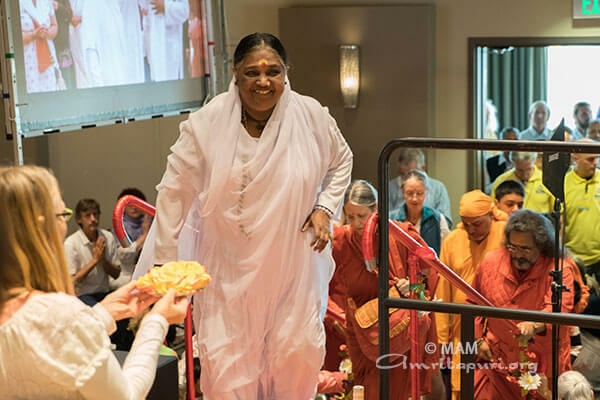 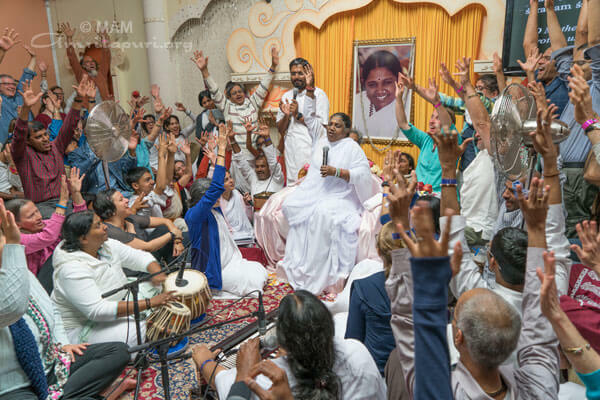 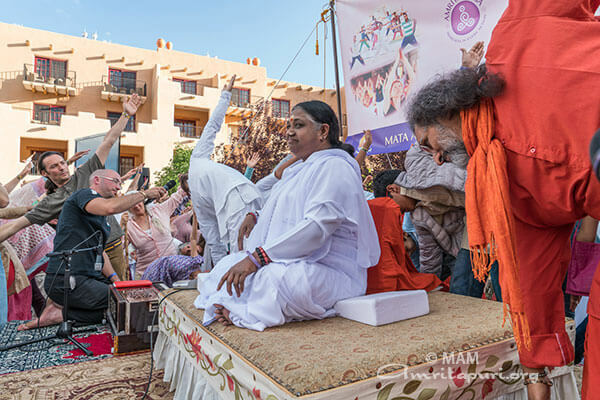 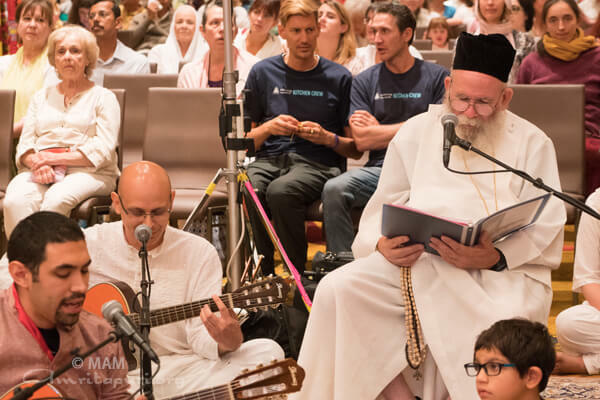 During Amma’s darshan time, satsangs groups from around the Bay Area and Northern California region including students from the two area BalaKendra groups sang bhajans, danced to traditional Indian music, and put on plays. 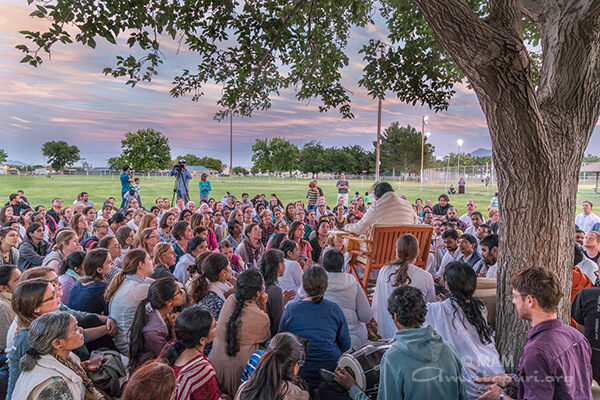 During the retreat, local devotees put on a play that began with Parvati Devi asking Lord Shiva if the devotion of a true devotee is more powerful than the Lord himself. 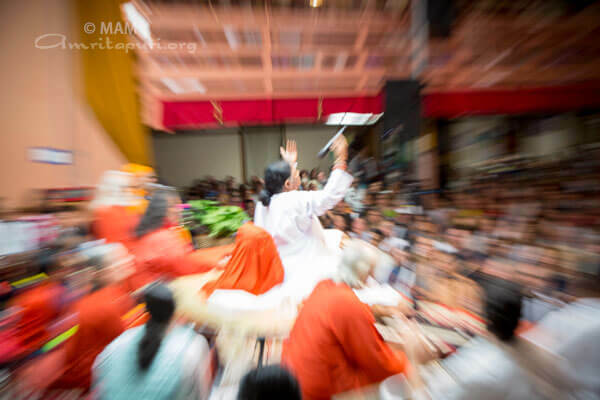 The play then depicted the story of how Hanuman’s unwavering devotion to Lord Rama turned even the most powerful of Lord Rama’s arrows into flowers. 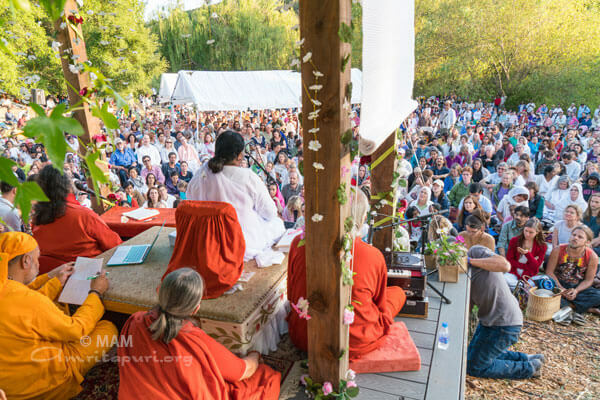 This proved Parvati’s statement true and underscored the power of devotion. 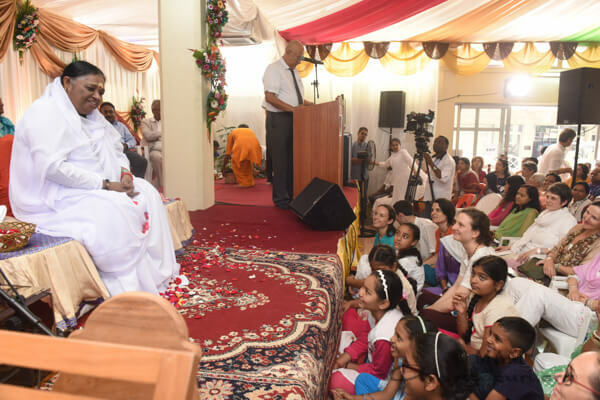 Balakendra students also put on a play based on the teachings of Adi Shankaracharya demonstrating how to be a good devotee. 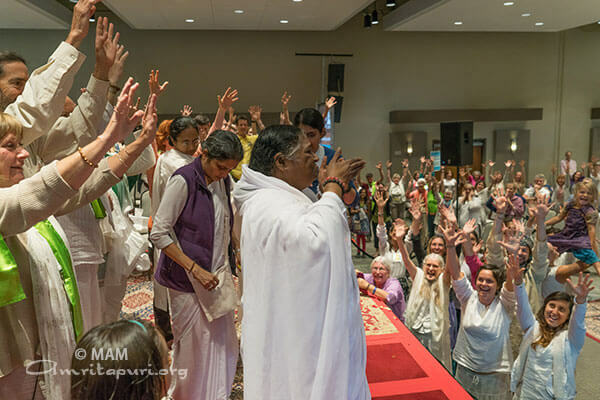 Amma began her 30th North American tour on June 5th with two days of programs at the XFINITY Arena in Everett, WA, USA. 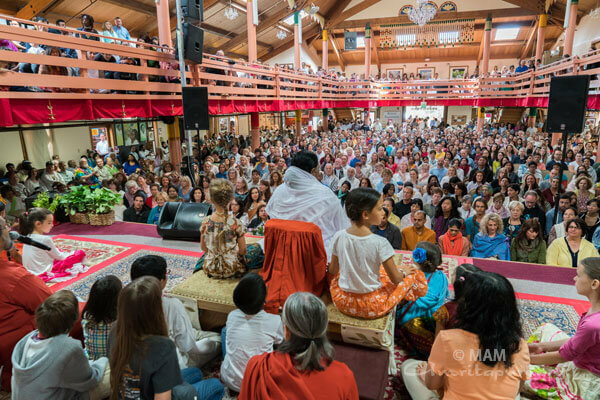 People came from all over the world to meet Amma and receive her darshan. 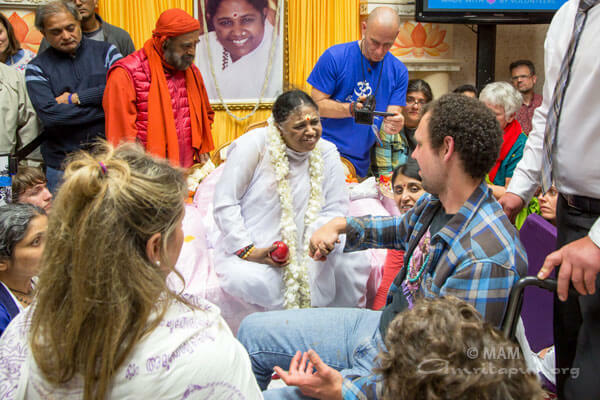 Seattle Foundation Board Member and noted philanthropist Linda Parks garlanded Amma welcomed her on the first day. 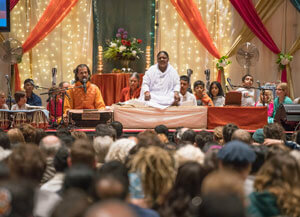 During the programs, local satsangs sang bhajans. 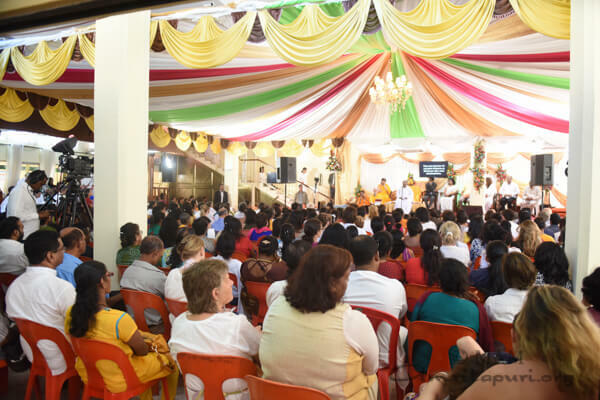 Local BalaKendra students put on a play about Sudhama and Krishna emphasizing the blessings of innocent devotion. 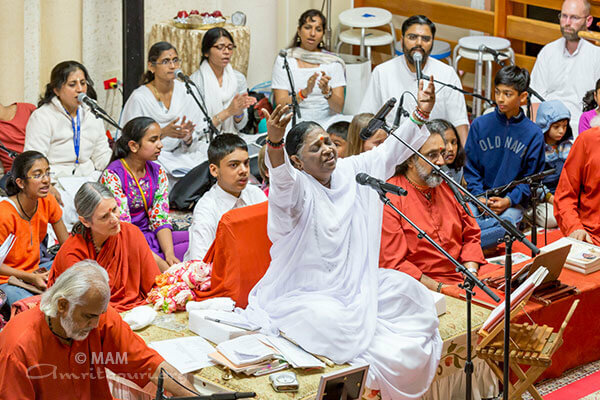 At the end of the first evening program, Amma delighted everyone by singing two bhajans. 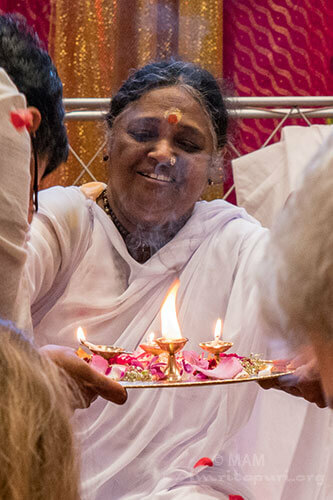 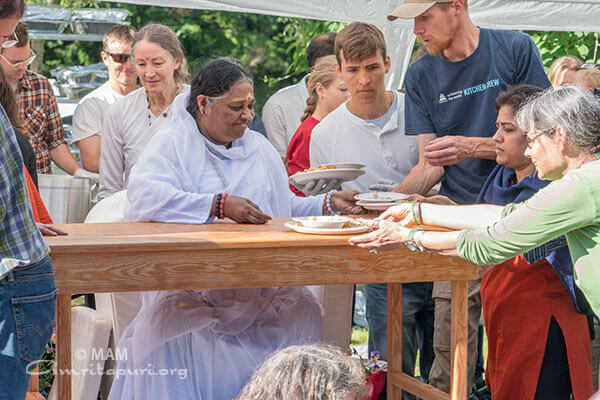 The day before the programs, Amma visited the new Seattle Ashram located in Snohomish, Washington, where she served breakfast to the local devotees, meditated, and sang bhajans. 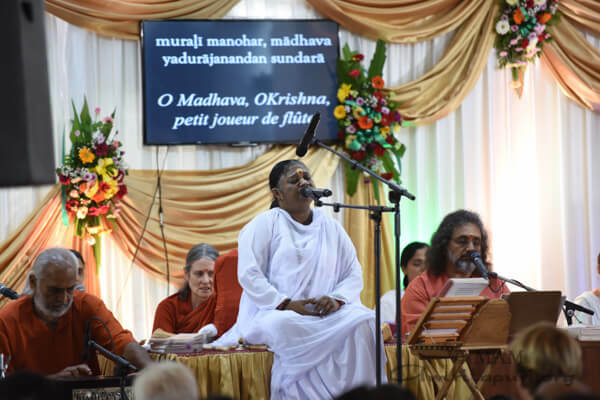 With utmost love and yearning for Her presence, devotees awaited Her arrival at the ashram with great fanfare while chanting “Om Amriteshwariye Namah.” Seeing Her entering the ashram filled our hearts with contentment after years of waiting had came to an end when she arrived in Mauritius on the 24th of April. 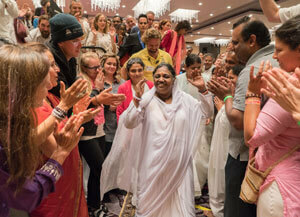 As she walked to the stage, Amma acknowledged each and everyone. 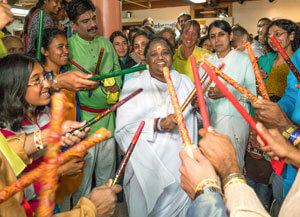 Her presence filled the ashram with divine energy. 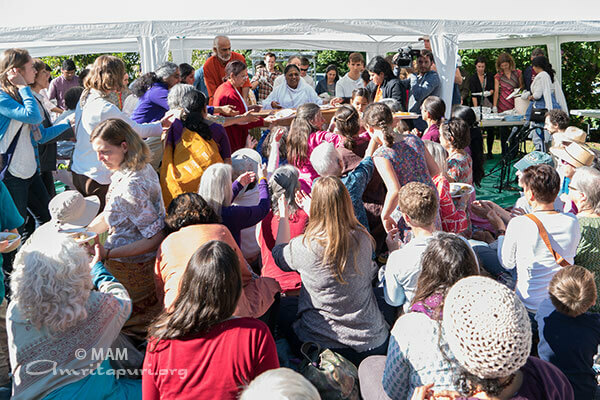 Amma then sang a few bhajans and distributed prasad dinner to everyone. 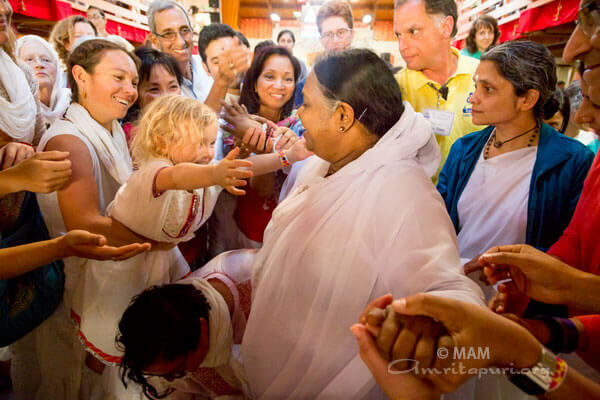 Amma also received a warm welcome back to Mauritius by different dignitaries. Amongst them were Vice President of the Republic of Mauritius, His Excellency, Mr. Paramasivum Pillay Vyapoory, and the Right Honorable Lady, Mrs. Sarojini Jugnauth, spouse of the Prime Minister. 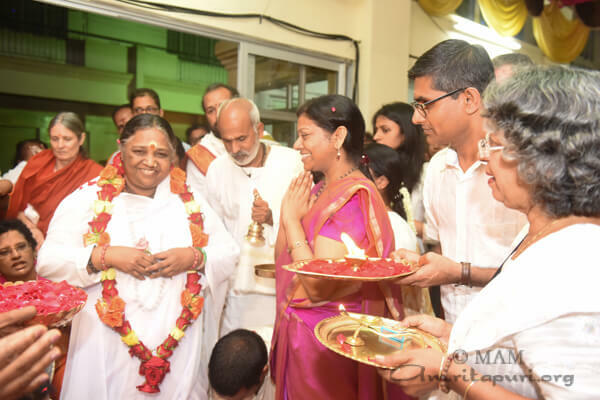 Several other dignitaries were there to welcome Amma. 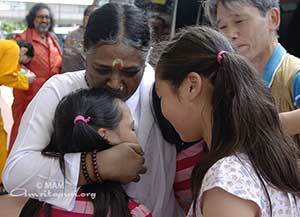 Amma’s arrival signaled the launch of several new humanitarian initiatives. 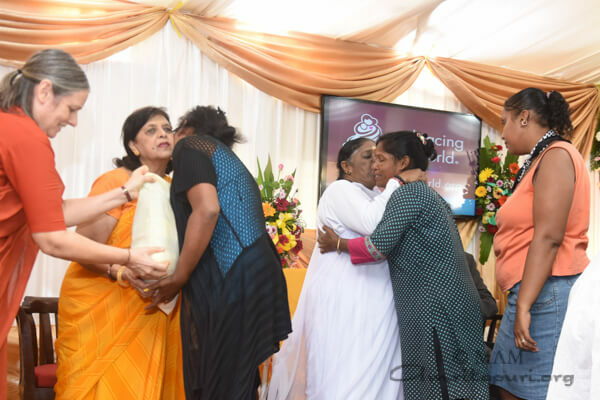 Over the past few years, the Amma Centre in Mauritius has been providing a monthly ration to many households experiencing financial difficulties. 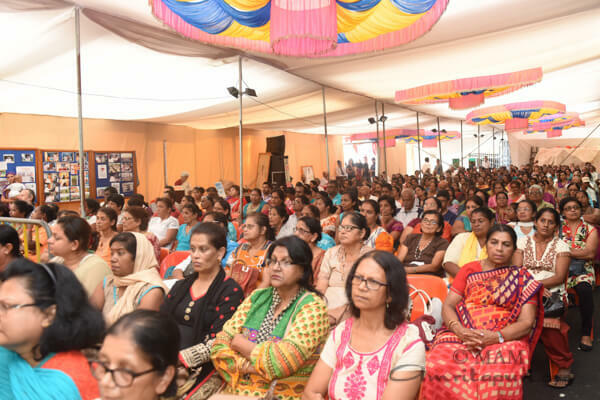 During Amma’s visit, the numbers of beneficiaries was extended to 60 additional families who received their first monthly ration and blessings from Amma. 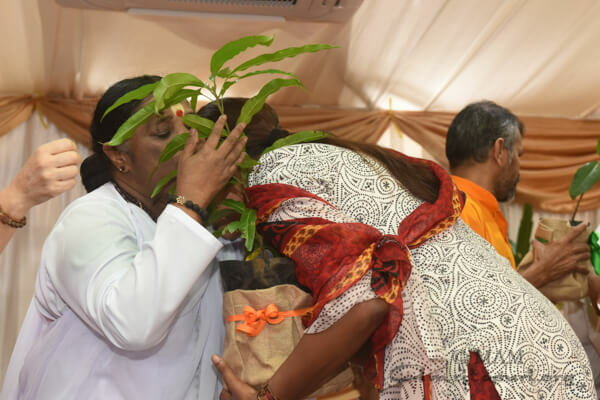 Saplings were also distributed to devotees to encourage them to take care of Mother Nature. 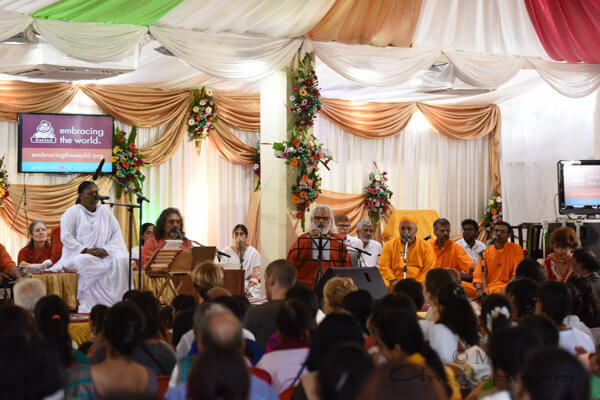 The two-day program consisted of Amma’s satsang, bhajans and darshan. 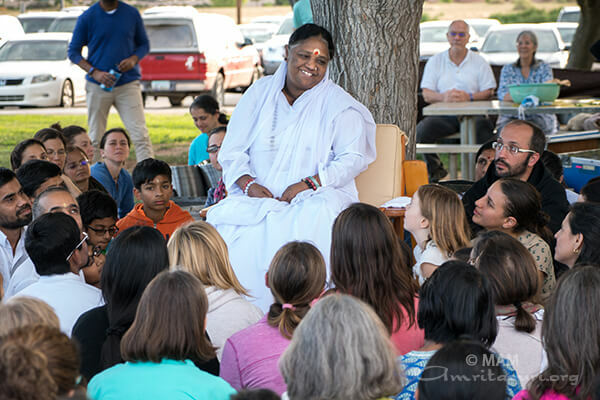 Each and every person who came to the program benefited from Amma’s wisdom, compassion and love. 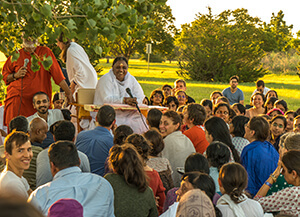 Amma’s discourses in Malayalam were translated into French and Creole. 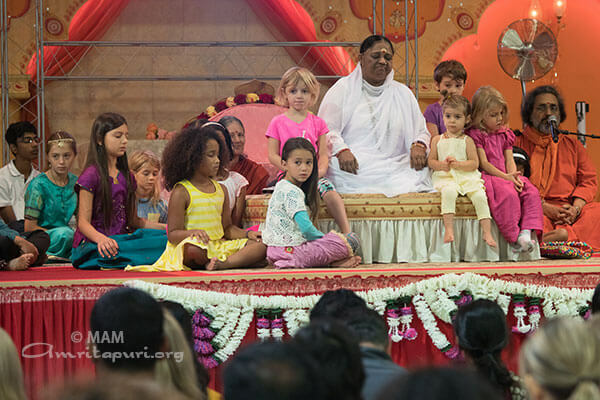 During Her talk, Amma emphasized on the importance of protecting Mother Nature and the benefits of cultivating our own vegetables. 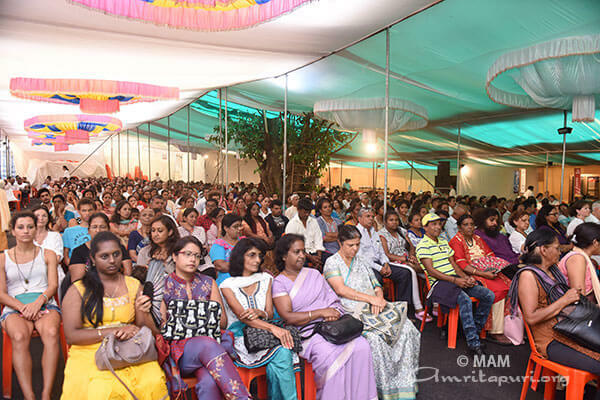 Amma said that each and everyone have a responsibility towards the environment and we should take a vow to plant trees each year. 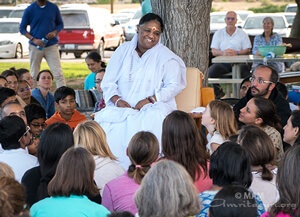 She talked about the loss of values throughout the world and how technologies are being misused. 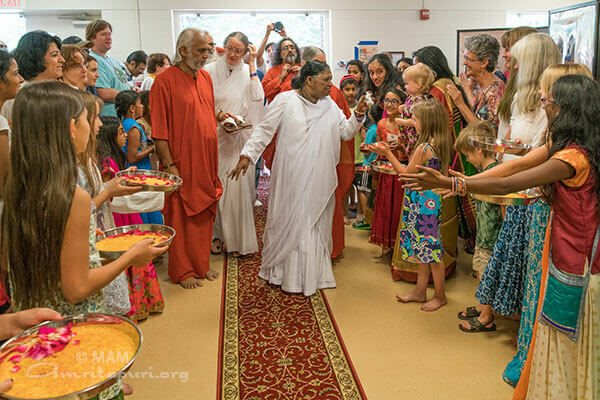 Nowadays there is less concern for elders in society. 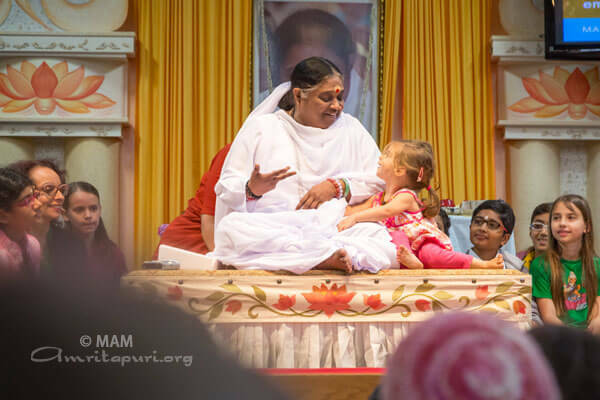 Amma emphasized that meditation, spiritual practices, and selfless service should be part of our daily activities. 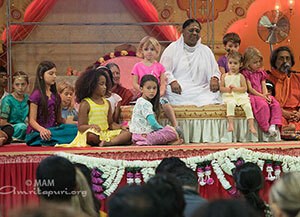 This year, Amma’s children from Mauritius composed a local song dedicated to Amma: “Nou Mama Amma. 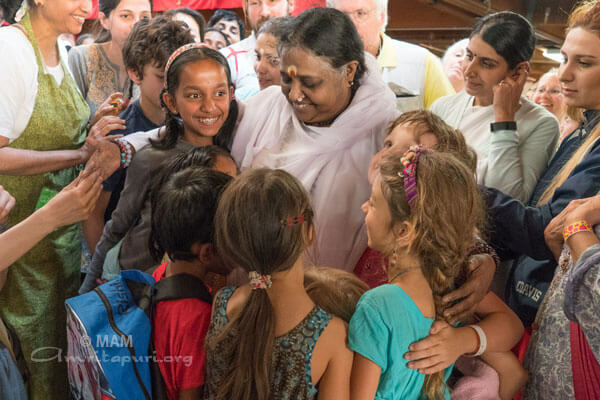 prends dans to lebras, donne nou beaucoup couraze, donne nou to la lumiere Amma” (Our mother Amma,.. take us in your arms,.. give us lots of courage,.. shower your light upon us). 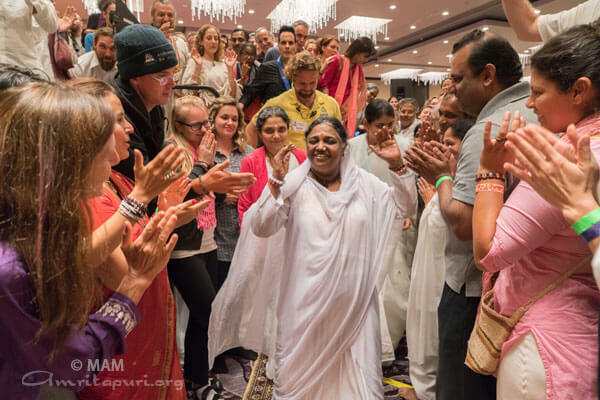 Just before leaving the stage, Amma danced to the traditional Baduga dance. 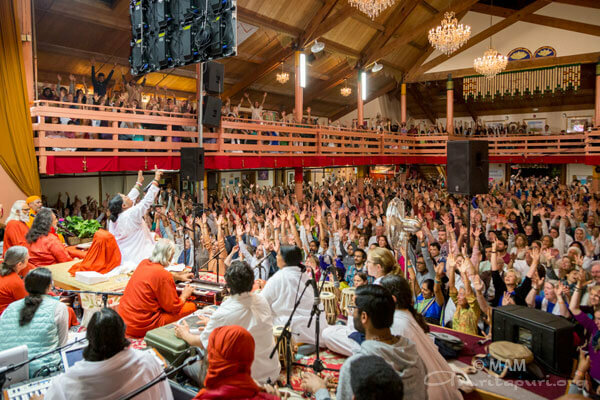 Everyone rejoiced and was elated in that wonderful atmosphere. 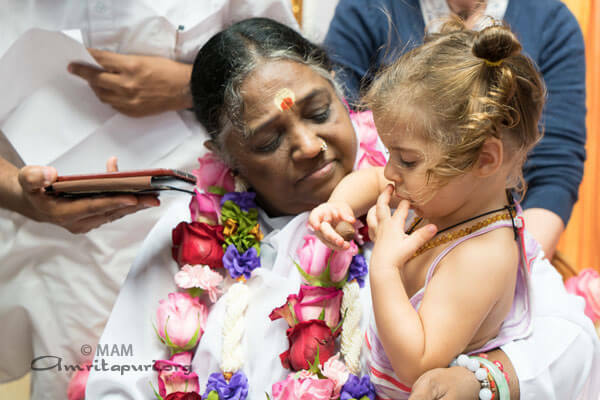 Upon her departure, Amma surprised everyone when she suddenly changed direction and walked towards the Brahmasthanam Temple. 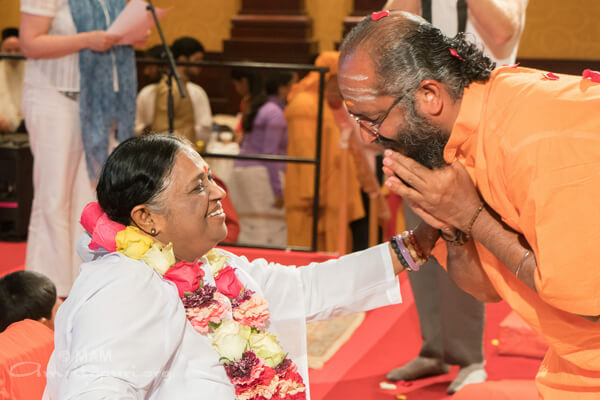 After circumambulating the Brahmasthanam Temple, she graciously walked to the car while acknowledging everyone’s presence either with a blissful smile or loving touch.